WOLF BLITZER, CNN: I’ve got some other important issues we’ve got to get to. In your address before Congress, you appealed to the United States to provide Ukraine what’s called major non-NATO ally status. Other countries like Japan, South Korea, Israel — they have this status. You want it. What did the president of the United States tell you? Will Ukraine be a major non-NATO ally, which is very significant? PETRO POROSHENKO, UKRAINIAN PRESIDENT: My answer would be, again, very straightforward. The answer of President Obama was no. BLITZER: He told you no? 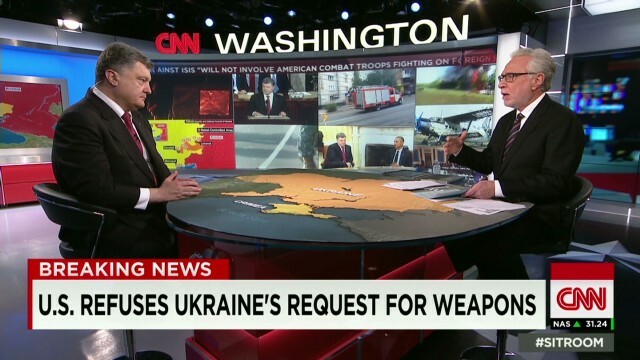 POROSHENKO: We received more than we asked. BLITZER: So you’re basically satisfied with what you got, even though you didn’t get that?